Life Before the Dinosaurs: Phacops. 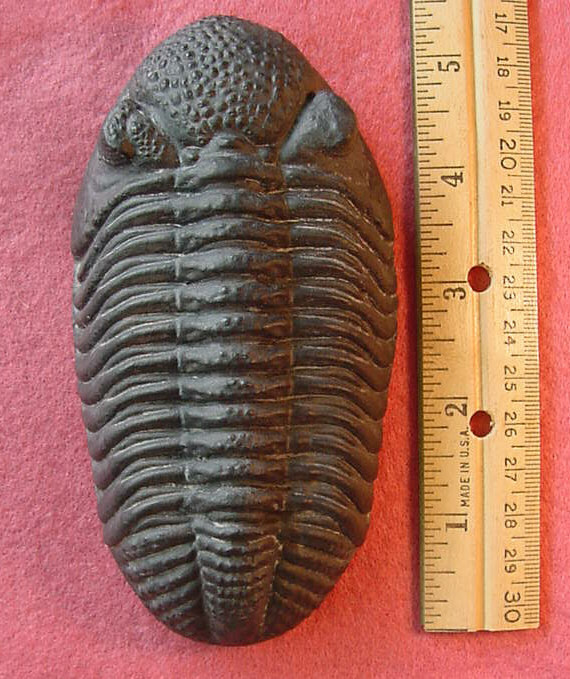 Phacops is a trilobite that lived from the Silurian to the Devonian Period. It had a large and bumpy glabella, or middle cheek. Even though many other trilobites could roll up like pill bugs, Phacops could do it more efficiently than other trilobites. But sometimes when they were rolled up they could get buried in sediment. Many fossils of Phacops are found rolled up into balls. Phacops was up to six inches long. Some people recognize it by its eyes, which resembled frog eyes. Phacops has been found in the northeast United States and Morocco, and is the state fossil of Pennsylvania. Phacops had a 360 degree view because it could turn its eyes to different angles. 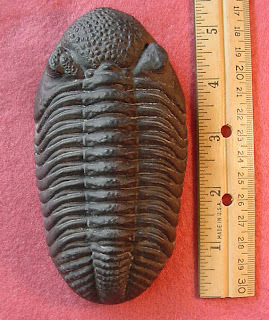 Phacops is one of the most common Devonian trilobites. Hurricane Irene knocked out power at our house yesterday morning and we're still in the dark. Who knows how long we'll be without electricity. Lots of damage in our neighborhood. We hunted around this afternoon until we finally found a place with power and wifi so Art could blog. We had to work fast because this Starbucks is packed to the gills and all the electrical outlets are taken. The battery on this laptop is dying, dying, dying! Neither hurricanes nor earthquakes will stop 'Life Before the Dinosaurs'! Good job Art-thropod. this blog is awesome. Keep up the good work. Morocco, however, has only one "r". Came here via Pharyngula; I think it's great what you're doing here. It is inspiring to see young people take up science as a hobby. Great blog! My son will visit here soon, he just completed a report (summer project), on Cicada Killer Wasps. They evolved more recently than Phacops, and currently overwinter in our backyard. May I suggest a battery pack, for this sort of emergency. Enjoyed your blog, and some day I'll actually put it in my blog roll. I've always liked trilobites, but I'd never heard of phacops. What cool animals! Super cool post! I had no idea what a glabella was in a trillobite. In humans it's the area between the eyebrows, so I guess that makes sense. Anyway, I've bookmarked your blog and am looking forward to more of your posts. This is EPIC! Art, you are Awesome! Keep up the good work! Thanks for the great and informative posts. This is a great website to practice/learn Math, etc! It's really cool! I really enjoyed your posts! It reminded me of when I was your age, some thirty-two years ago, and how wonderful I thought science was (However, you are light-years ahead of where I was!!!). Your spark gives me great hope of a future of wonderous ideas that my daughter will be a part of. Even at my age, it is a truly wonderous and refreshing feeling when someone so young can teach me new things. My little boy is 6 and he also is very interested in science and nature. When he's a little bit bigger we'll read you posts together. I like your blog. Keep up the good work, Art! Hooray for phacops rana! I grew up searching for them in the creeks around the house! Western NY is littered with little phacops corpses. Big ones, too. There was something else about their eyes, the lenses were made of crystals of somethingorother. 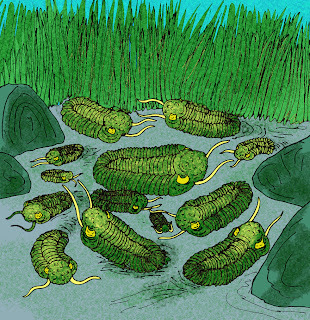 Read about it in Richard Fortey's "Trilobite: Eyewitness to Evolution." Wish I could remember what the crystals were made of. Good book, though. Phacops eyes are truly unique. Oops--I fixed the Morrocco/Morocco error. Thanks! Thank you so much for all the really nice comments! It makes me feel really happy that you love my blog. @Jafafa It's cool that you were able to find so many fossils of Phacops! Our power is still out from Hurricane Irene, which was a category 1 when it hit Virginia, because there is a huge tree that fell onto the wires right near our house. I want the power to come back on. And now there's another hurricane, a category 3 hurricane, that might come. I want the power to come back on so I can use the internet!